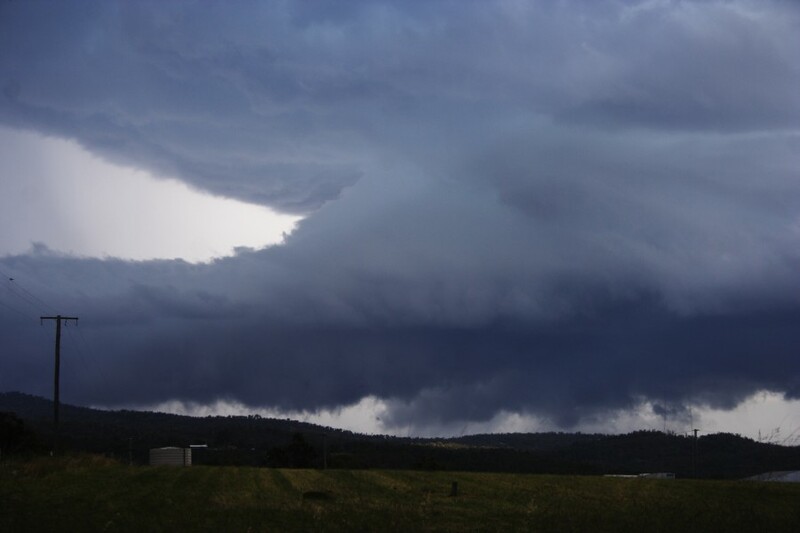 After a relatively quiet start to a storm starved season, a supercell surprised residents in the Grafton region on the 28th November 2009. Ample moisture, heating and adequate sheer combined with a likely boundary from early activity to produce menacing structure. 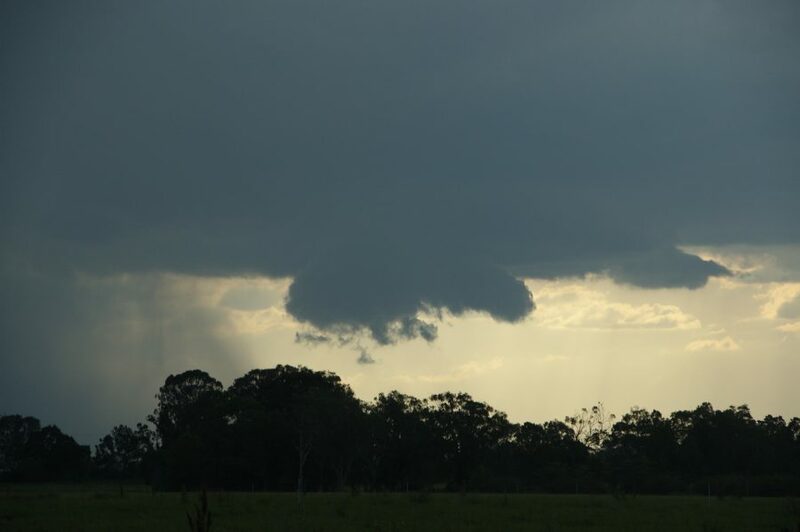 A wall cloud was observed as the storm further organised. 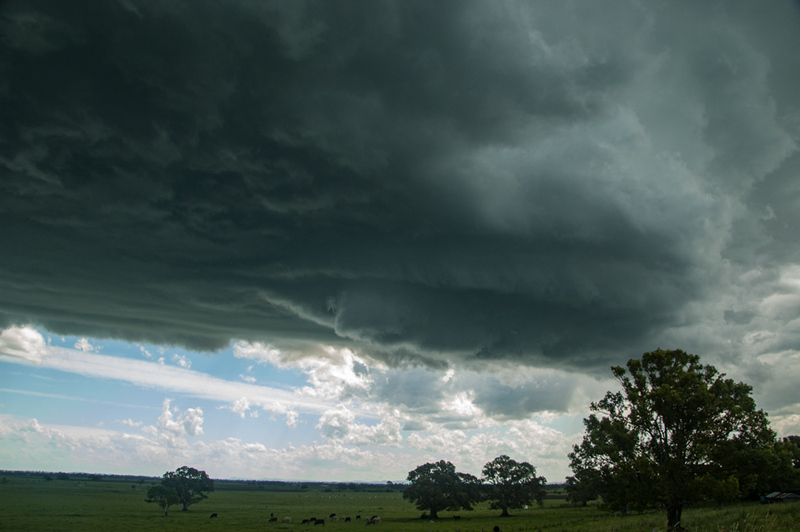 As one would anticipate, the outflow became too strong and pushed outwards undercutting the wall cloud. 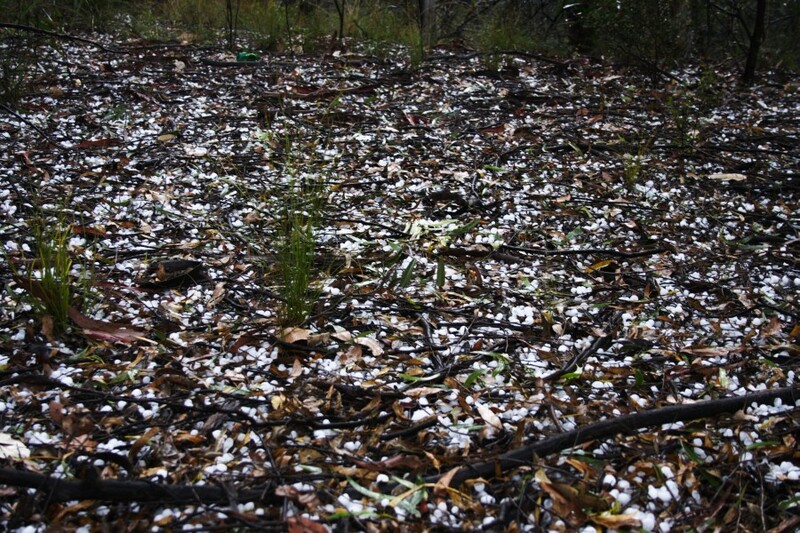 The storm produced a swath of hailstones to about 4cm as it passed to the south of Grafton. Radar structure for the earlier period of organisation was spectacular. 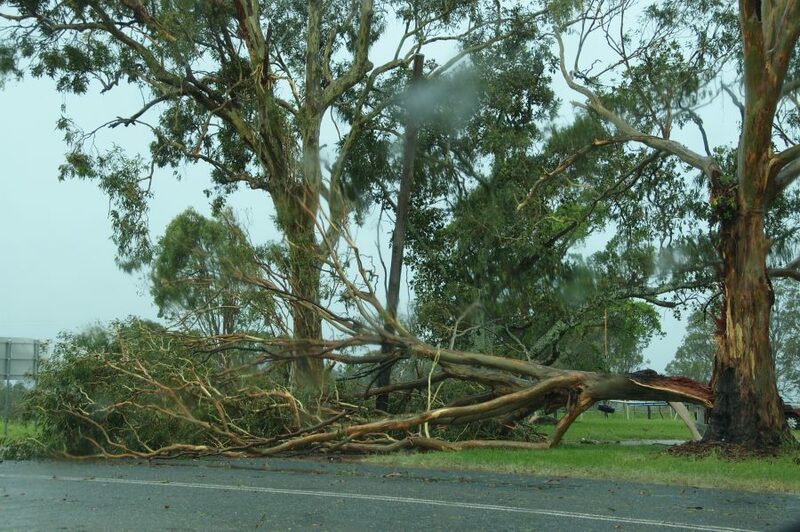 No majaor damage to major townships was observed though strong winds from downbursts brough down trees in the path of this particular storm. 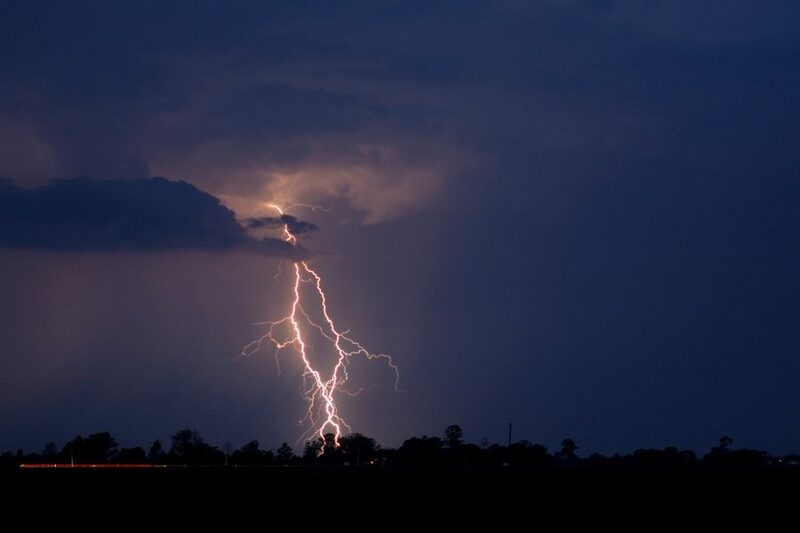 Frequent lightning strikes however featured on this and other storms on the day. 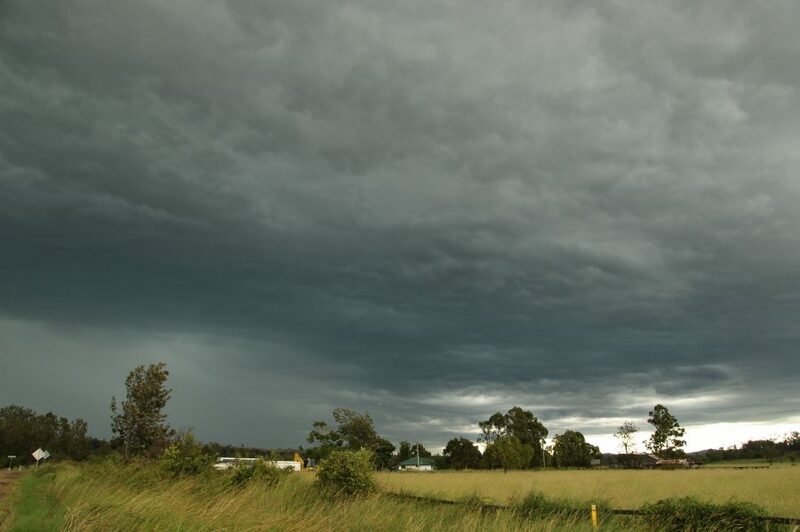 Photographs by Michael Bath The start to the 2009/10 thunderstorm season in NE NSW and SE QLD has been poor with a lack of low level moisture available. According to the models, the 7th October was to be another moisture starved setup. However it was obvious by looking at the morning sky that the situation had improved and the trough was well positioned for SE QLD. 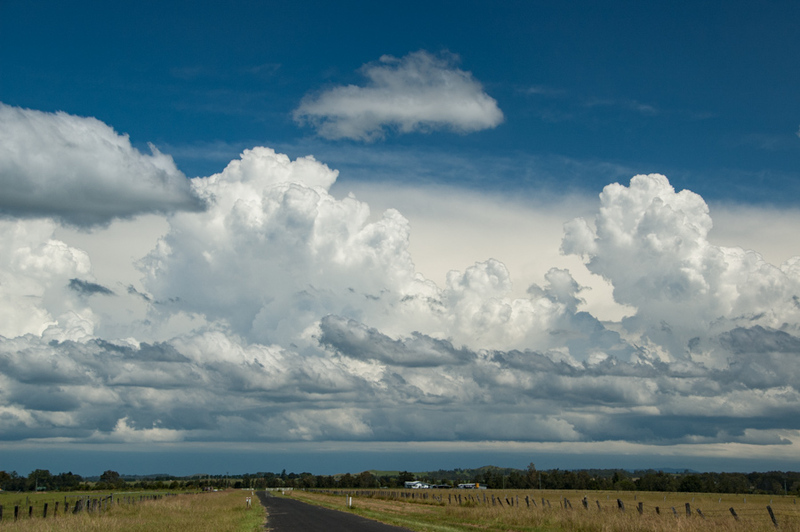 In Caloundra for a few days holiday allowed for a storm chase through the Blackall Range. 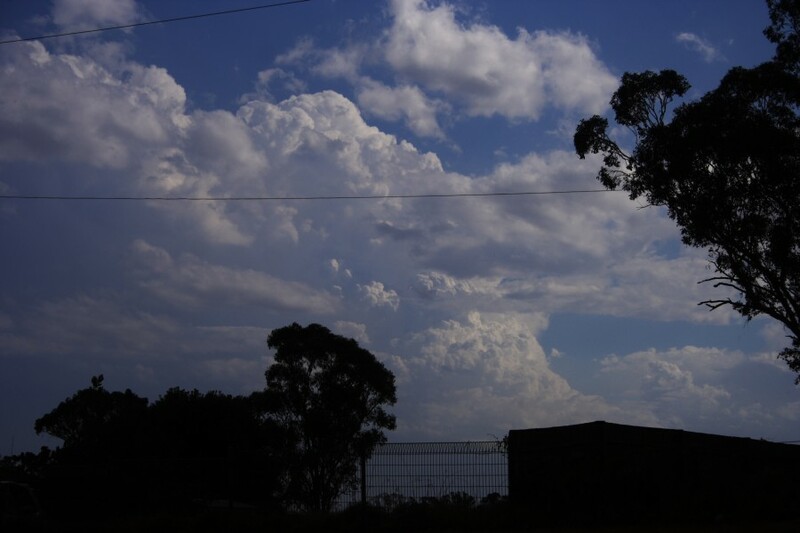 Convection commenced by late morning. 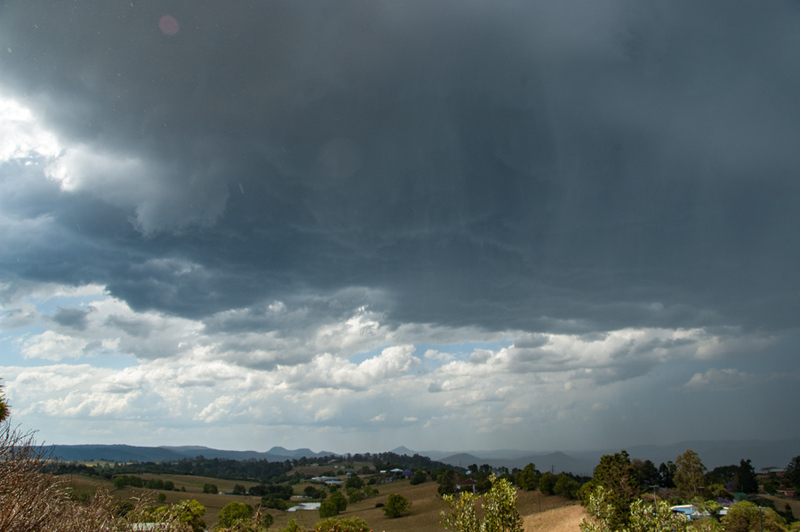 A small cell at Maleny dropped a few small hailstones before it weakened to the east. 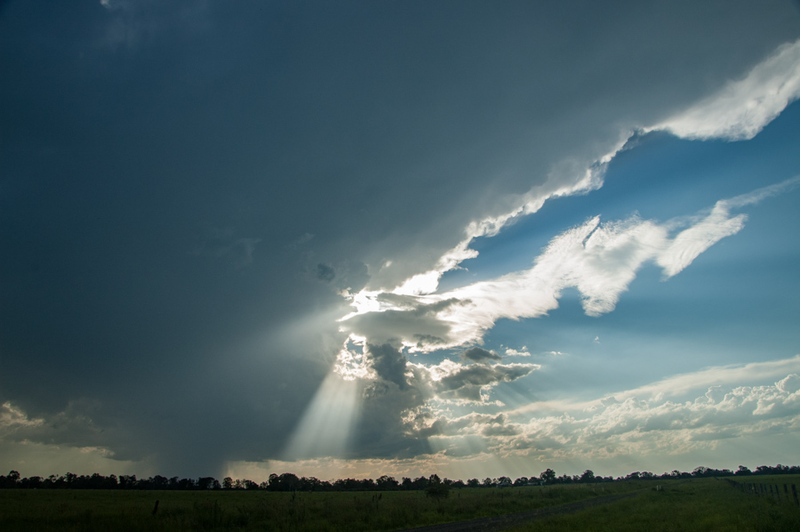 The chase continued northwest then north to Kenilworth where a stronger storm had formed. 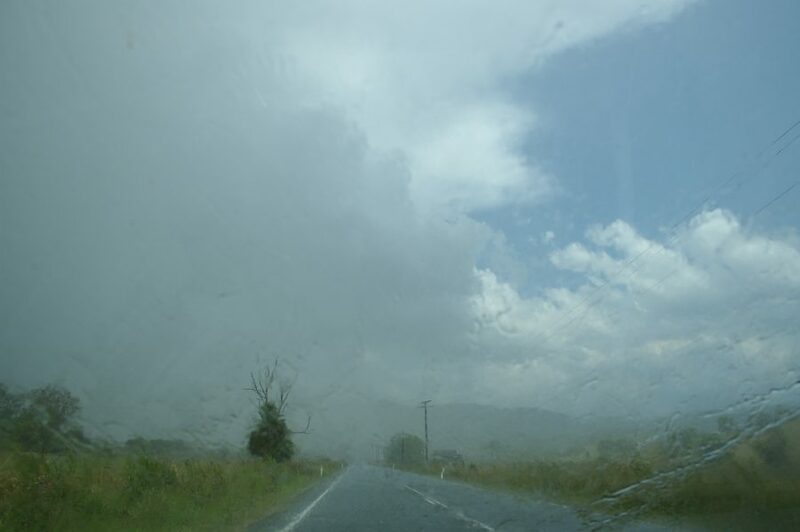 We followed it east to Nambour moving in and out of torrential rain at the back of the cell. 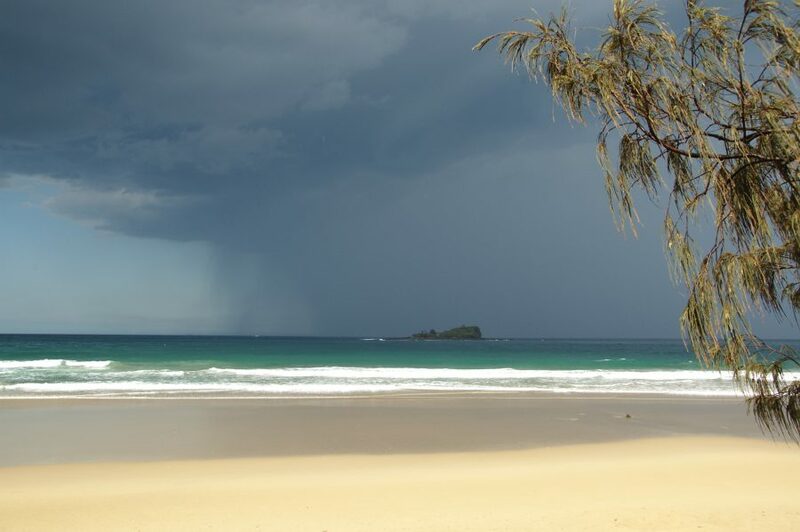 This storm continued east crossing the coast near the Sunshine Coast Airport. 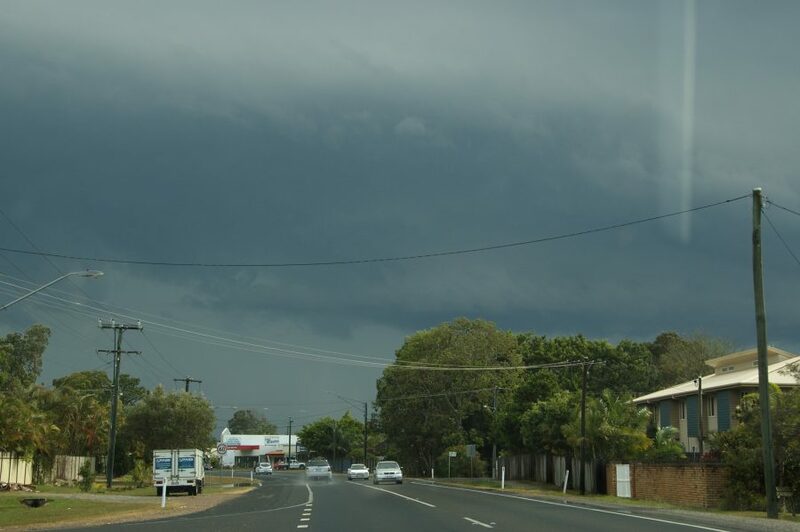 During the drive south to Caloundra a line of thunderstorm activity spread in from the southwest. Further heavy rain and some close lightning occurred before all activity cleared out to sea by 4pm. 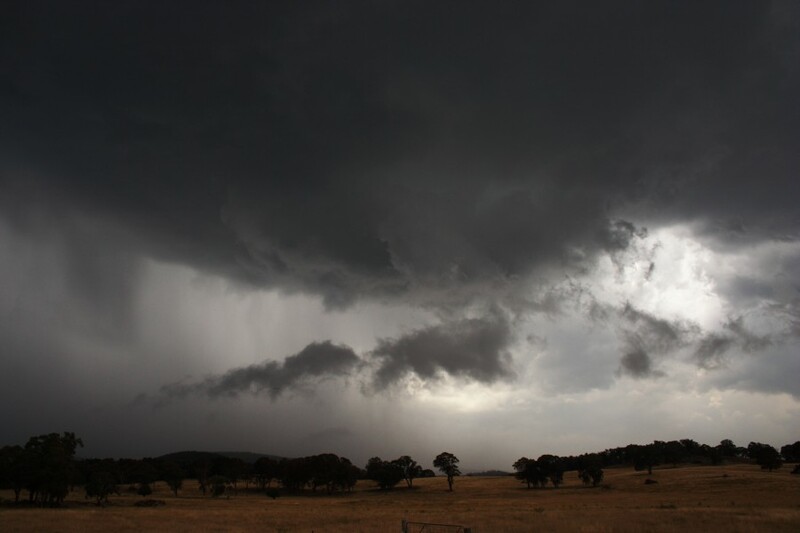 Storm organisation on February 21st 2009 at best was anticipated to be relatively brief to produce sustainted severe storms. 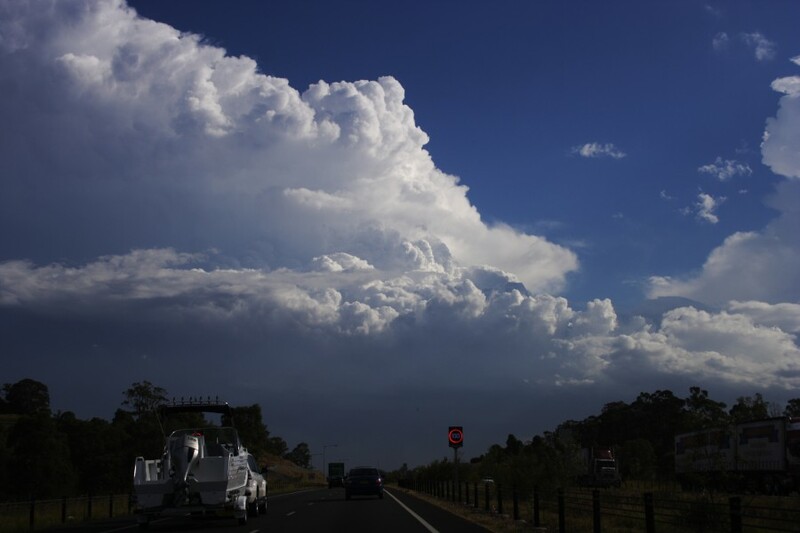 However, the storm that developed south of Campbelltown during the mid-afternoon period developed along a boundary in an unstable environment. The forcing from either side of the boundary was sufficient to cause rapid development. 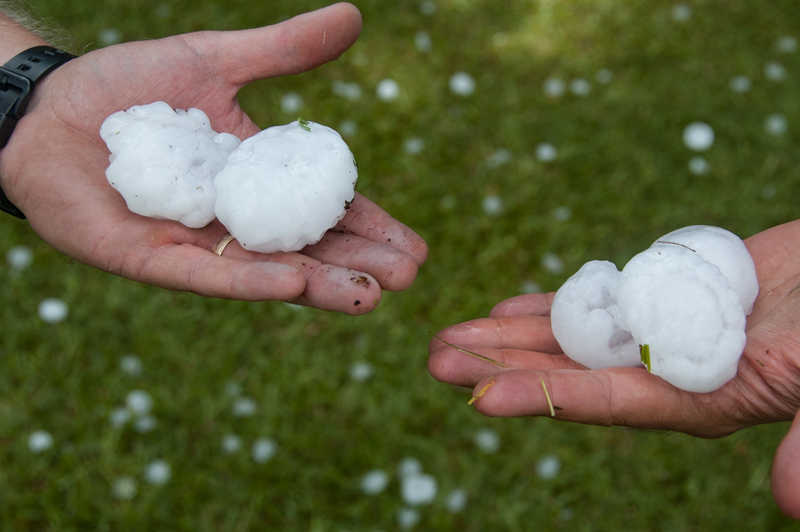 The storm developed rapidly into a hailstorm with possible rotation. Lightning was active especially from near and east of the main core. 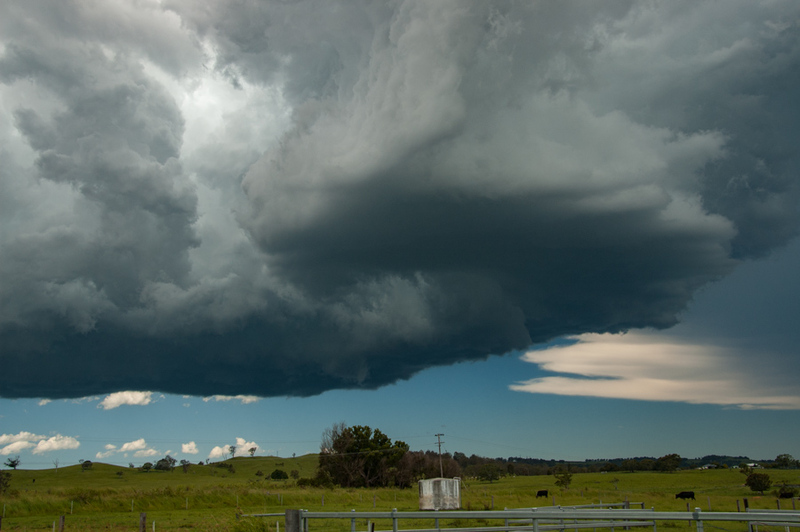 Although a short wave was anticipated to produce possible supercells across northern parts of the Central Tablelands to Hunter region, this funnel cloud intercepted north of Lithgow was still a surprise and swhirled overhead rotating for several minutes as the storm drifted towards the Wollemi National Park. 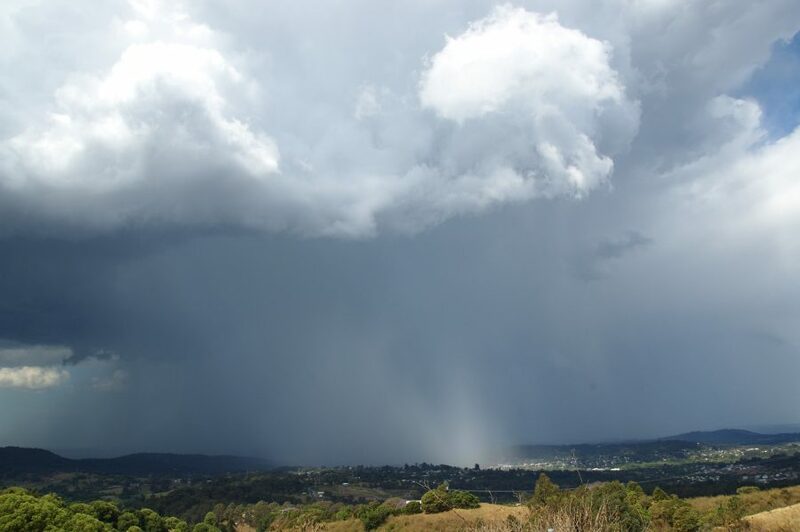 The storm had developed rapidly west of Lithgow along a boundary demarkating a wind change. 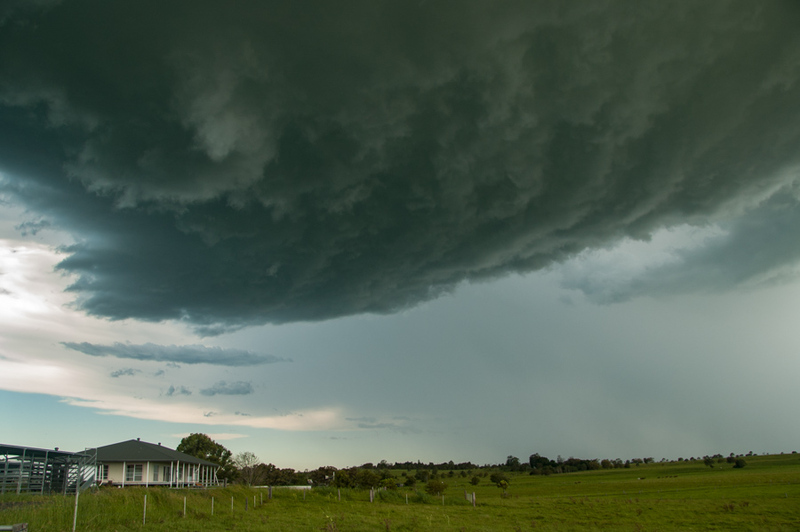 This storm rapidly organised and formed part of a supercell that tracked towards Singleton producing hail to 6cm in diameter. 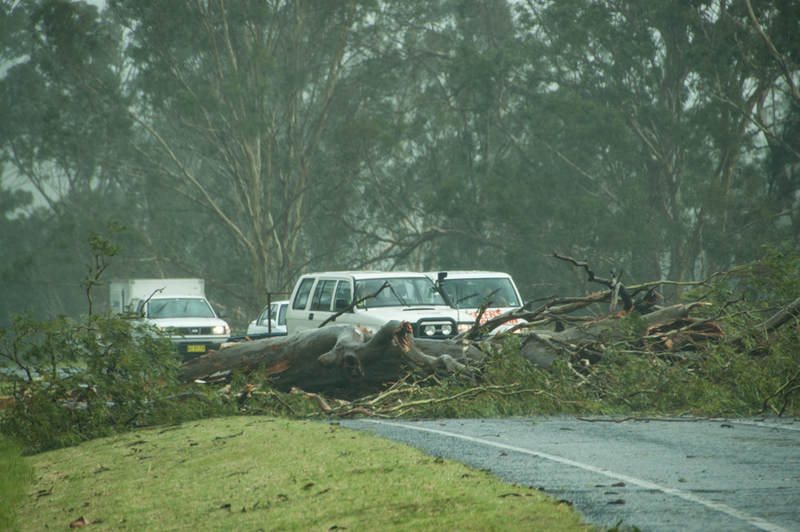 The 30th December 2008 brought extreme instability to the NSW Northern Rivers district with CAPE approaching 4,000. Shear was excellent, however moisture was marginal. 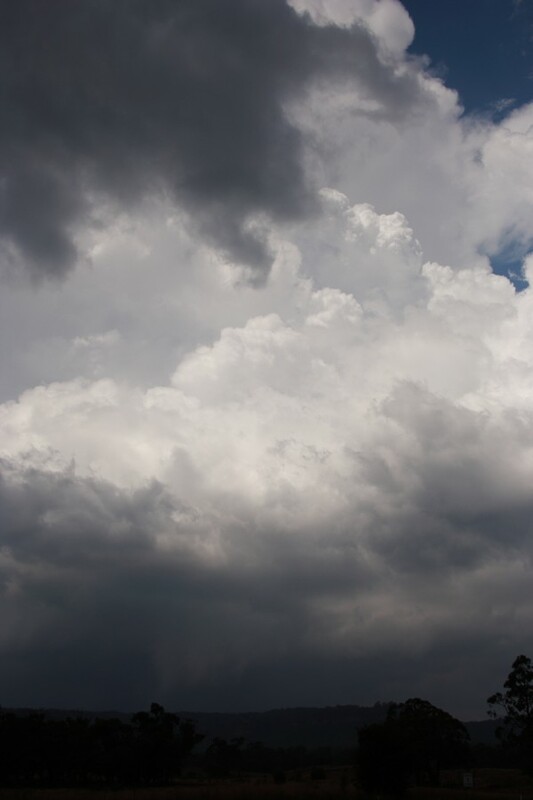 A seabreeze boundary kicked off an isolated storm near Casino mid afternoon. The first couple of updrafts were weak before a very strong sustained pulse developed. 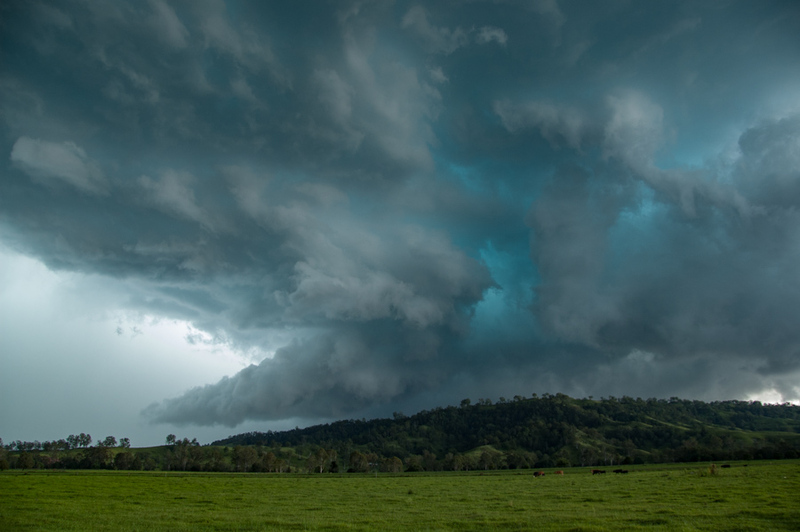 The structure evolved into a LP Supercell between Lismore and Casino before transitioning into a classic supercell as it tracked over eastern parts of Lismore, McLeans Ridges then just north of Byron Bay. 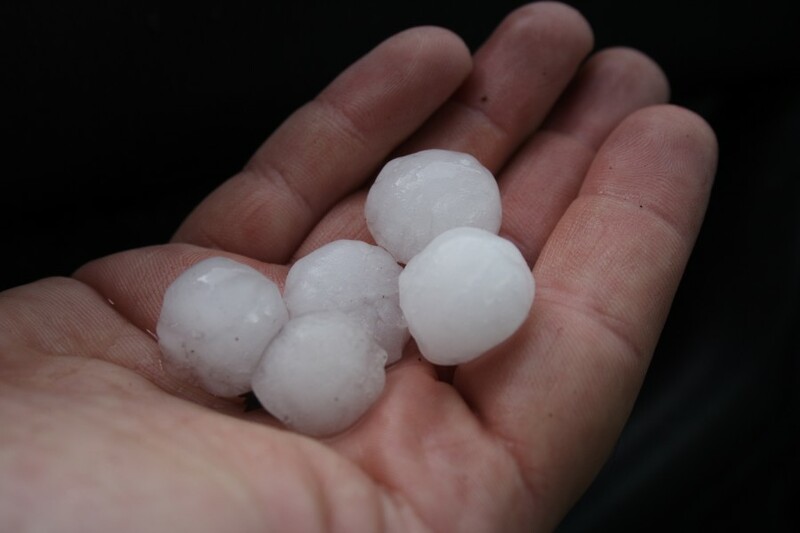 Giant hail and a number of funnels were observed. 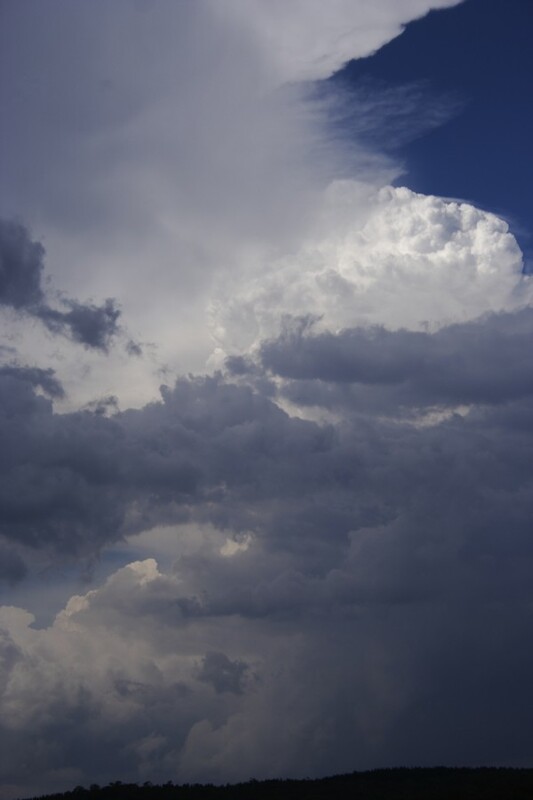 The supercell persisted for hours out to sea. 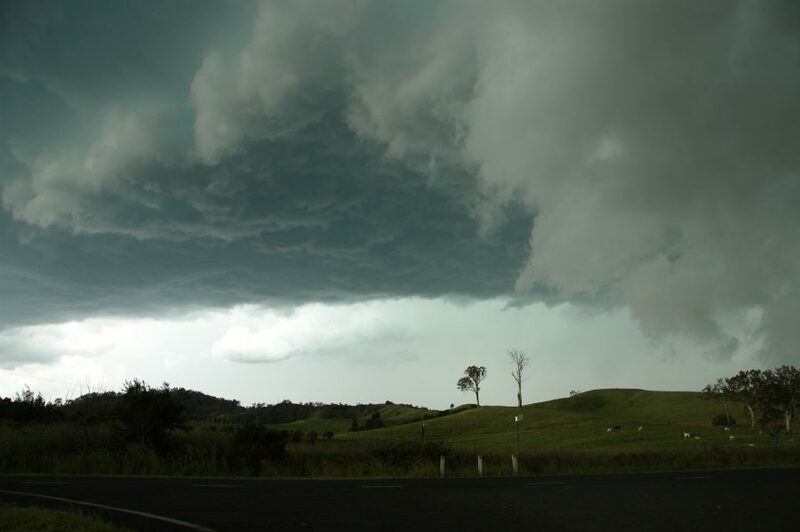 December 2008 was an active month for severe thunderstorms across the Northern Rivers region of NSW. 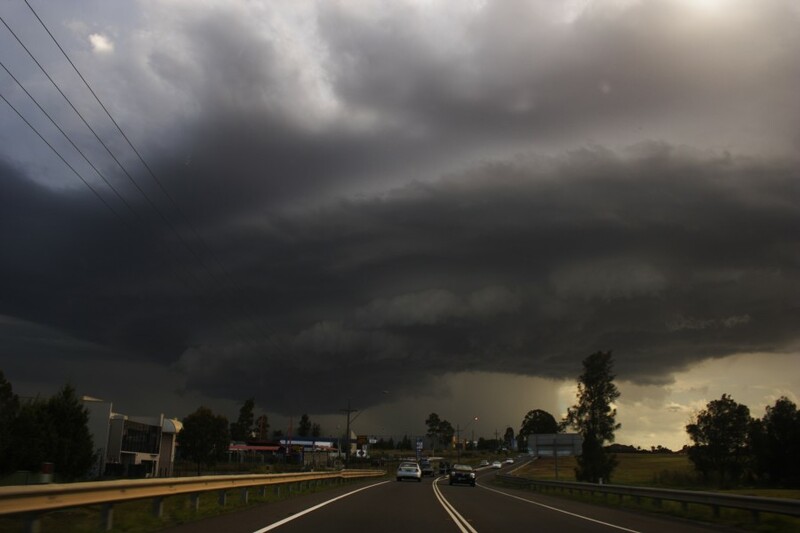 Several destructive supercells were observed with a particularly nasty event on Christmas Eve. 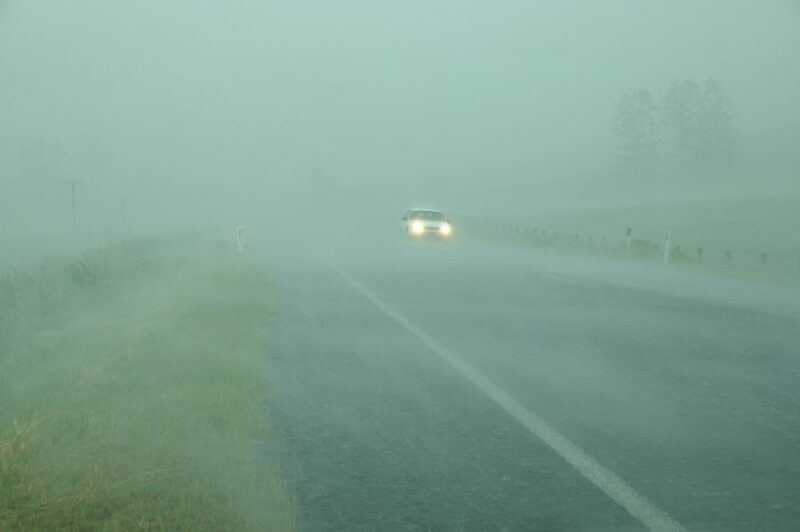 Winds gusting over 130km/h were observed from the outskirts of Kyogle through to Collins Creek. Flash flooding and hail to 3cm were also observed. Roofs were ripped off homes and trees knocked over. 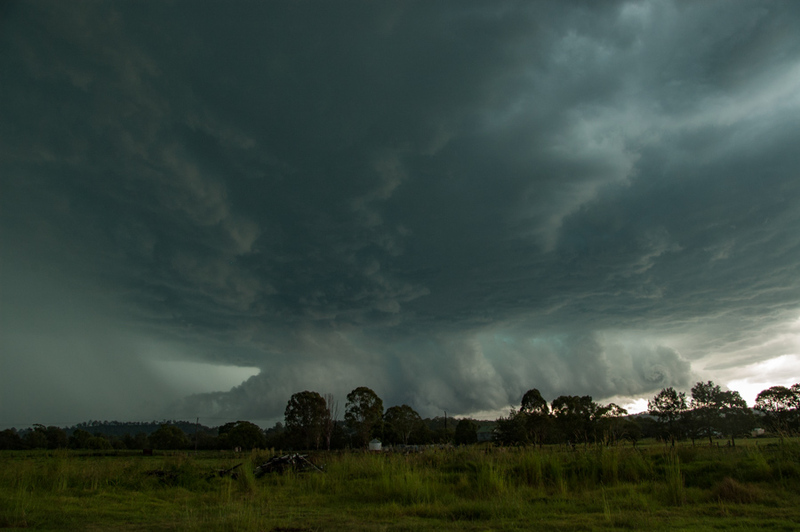 The HP supercell rapidly formed on the Richmond Range before advancing northeast towards the Queensland border. 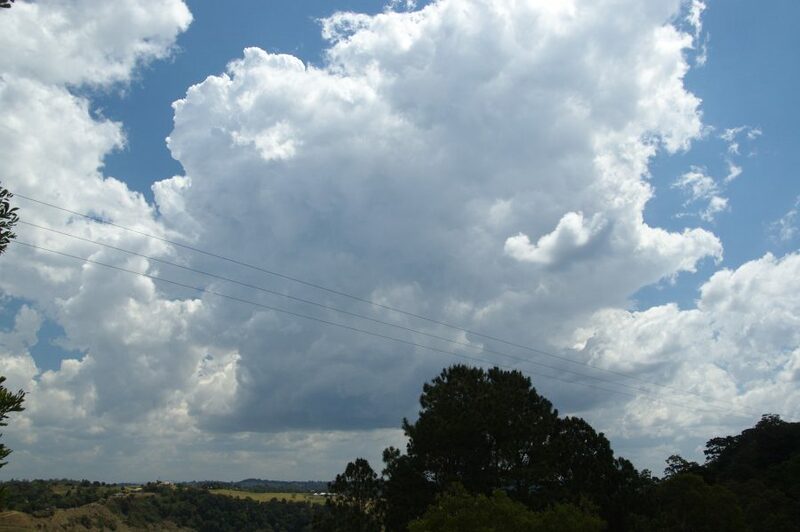 The 16th March 2009 was shaping up as a significant thunderstorm day for the NSW Northern Rivers region. Instability was very high for March with an upper trough moving through. Unfortunately a lack of capping and weak low level shear meant storms would only briefly organise before becoming outflow dominant. 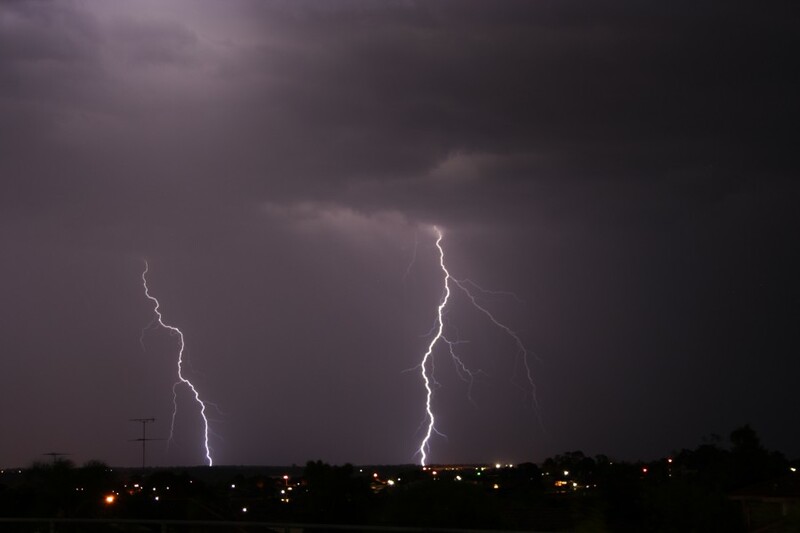 Storms formed pre-dawn on the Northern Tablelands and persisted and advanced across the region and into Southeast Queensland by mid afternoon. Several severe pulse storms developed in a line of activity mid afternoon with several reports of hail to golf-ball size - including in Alstonville. 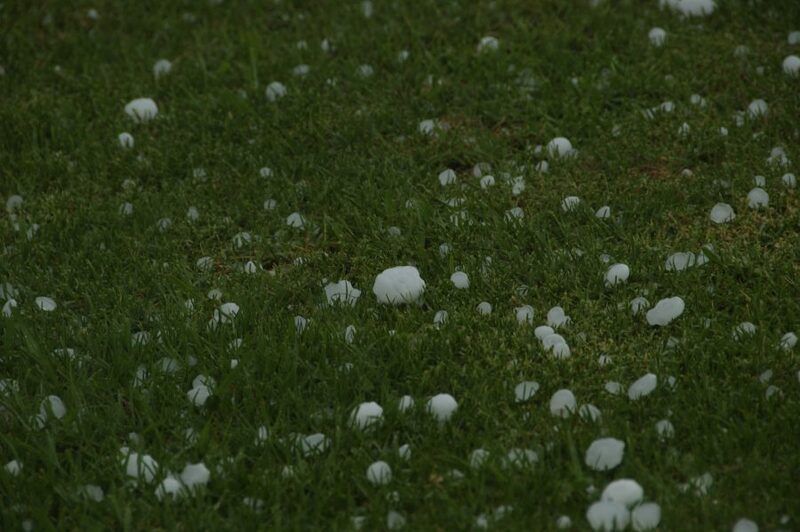 Hail photo by Chrissy Dott. The models on March 15 2009 indicated to potential targets for severe weather. 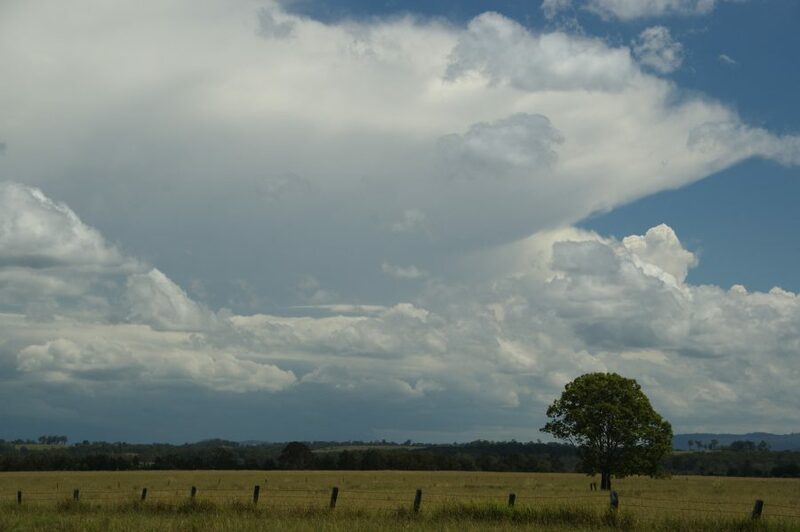 The first saw storms develop rapidly over the Hunter Valley near and around Singleton to Muswellbrook. 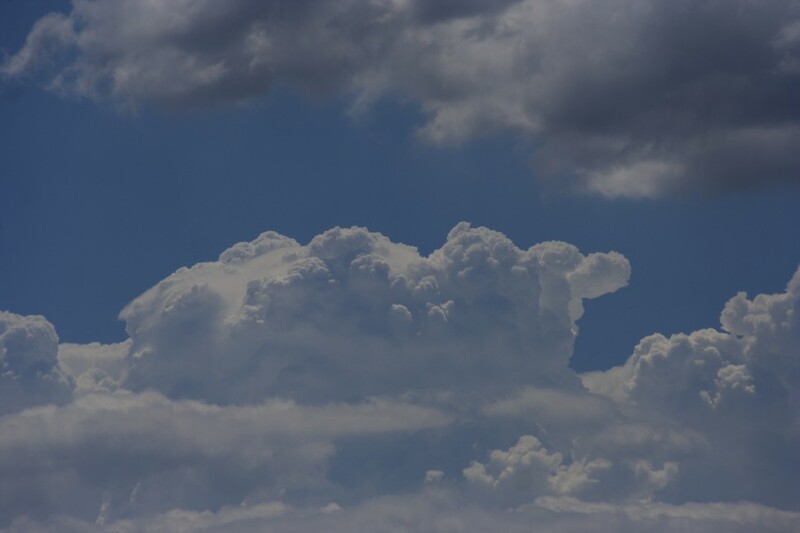 Further storms developed in the second target during the day beginning from a relatively small but explosive cumulus. The storm once mature immediately produced a classi split. The left moving storm proceeded towards Bulahdelah side swiping Karuah. 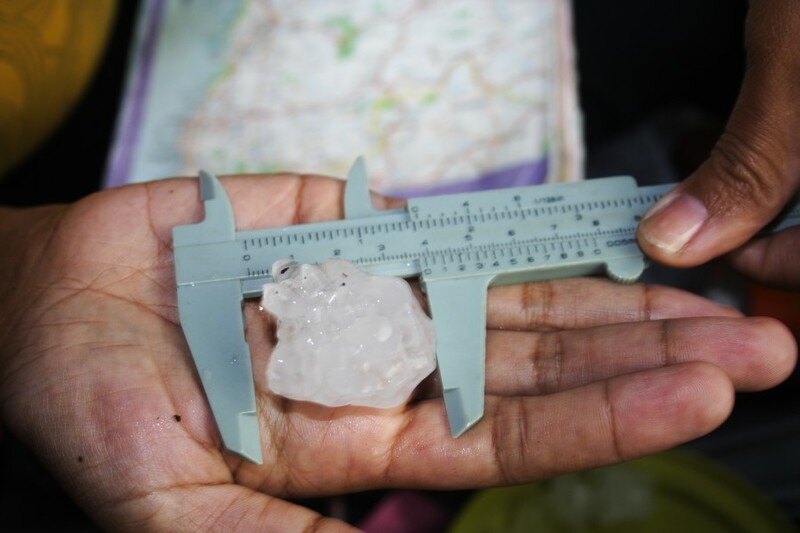 Hailstones to at least 3cm were observed from the anvil. 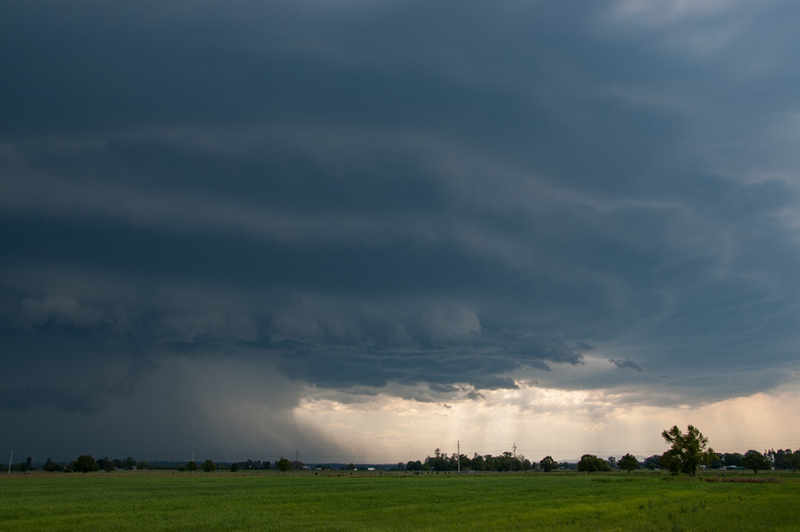 the storm exhibited Low Precipitation Supercell characteristics. 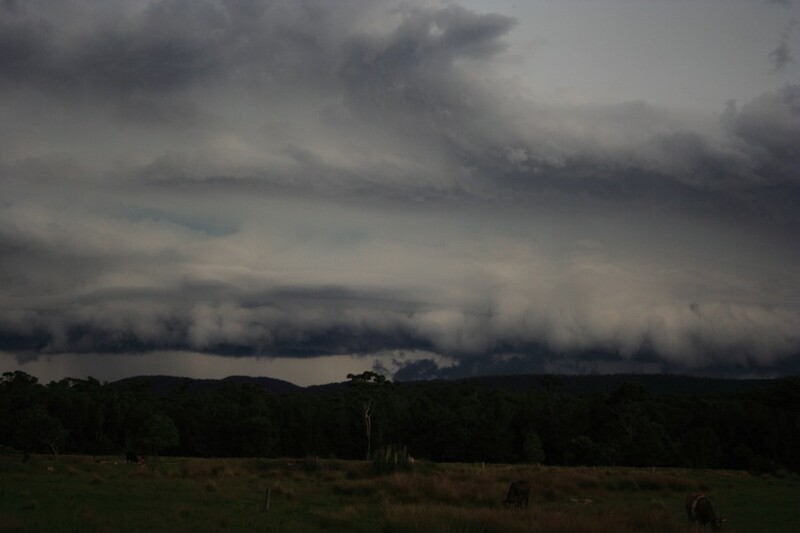 Eventually the storm weakened as it approached Bulahdelah. 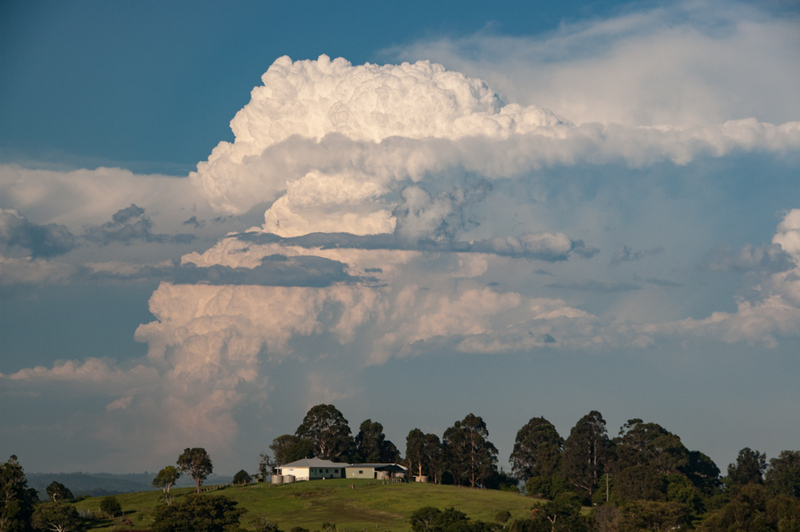 A second storm complex with spectacular structure approached Bulahdelah. 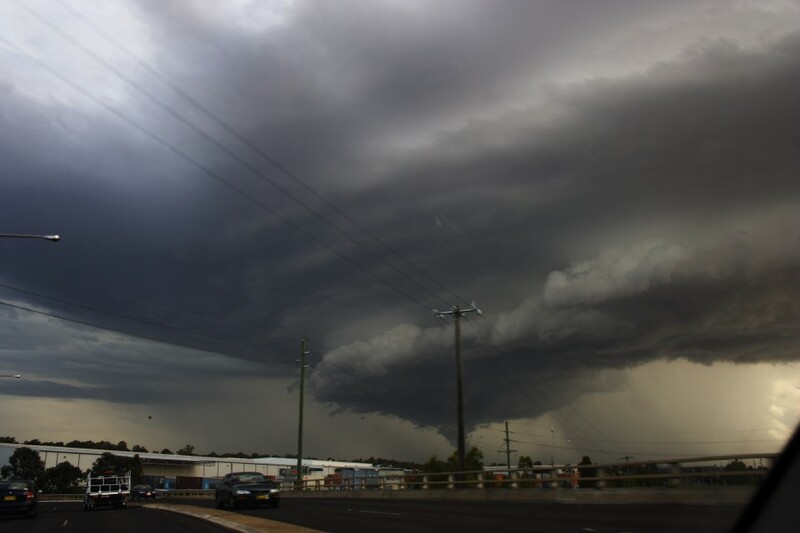 Given the relatively low probabilities for severe weather the models were indicating, the February 23 2009 classic supercell approaching southwestern Sydney was a surprise. Conditions during the day though showed sufficient shear with excellent turning and rich deep moisture. 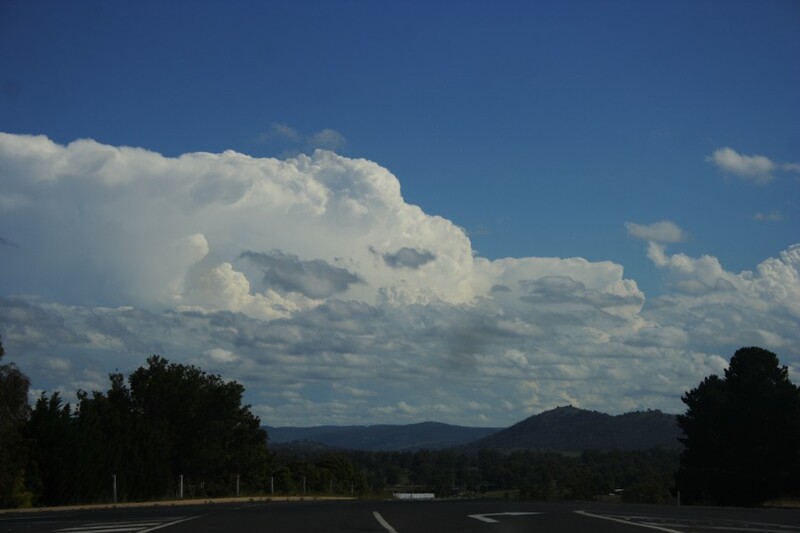 Storms developed further west with one particular storm exploding as it neared the environmental boundary of rich moisture and higher instability near Warragamba Dam. This storm then made the left turn and exhibited a hook echo on two or three radar scans. 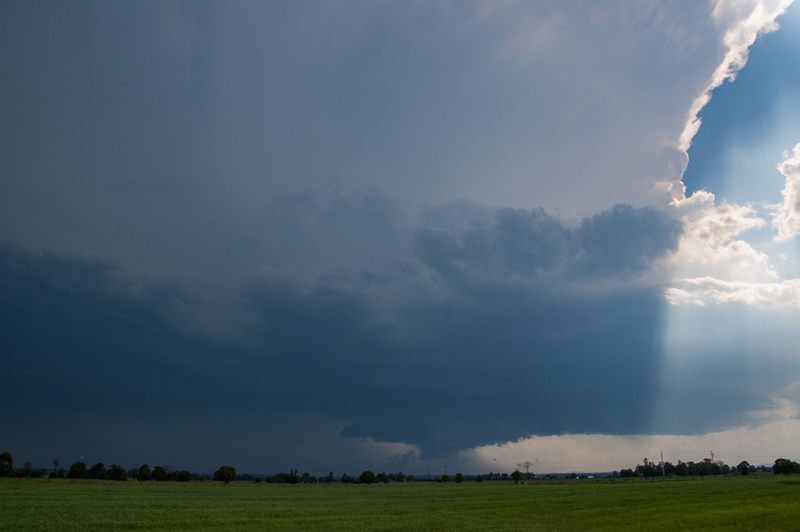 The storm even produced a wall cloud at its most mature stage. 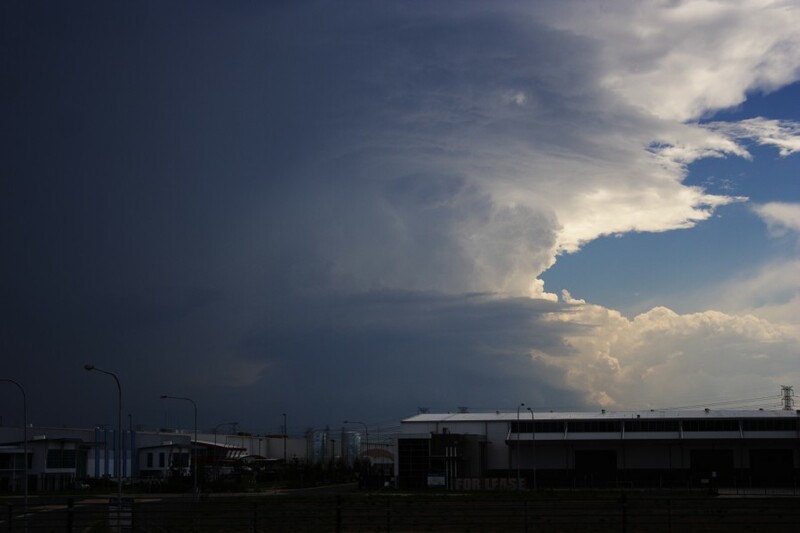 Eventually the storm crossed the boundary and was unable to sustain its structure rapidly weakening and drifting across the Sydney basin. 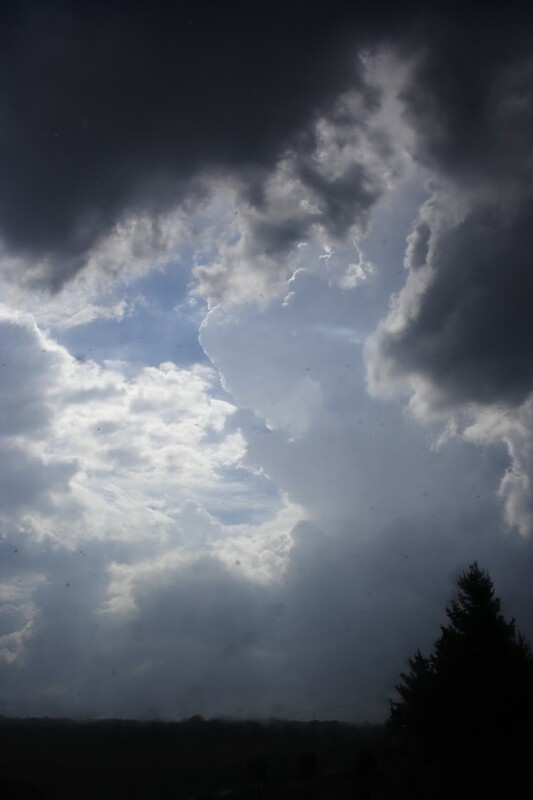 Another storm had developed to the north which produced heavy rain and frequent cloud to ground lightning. 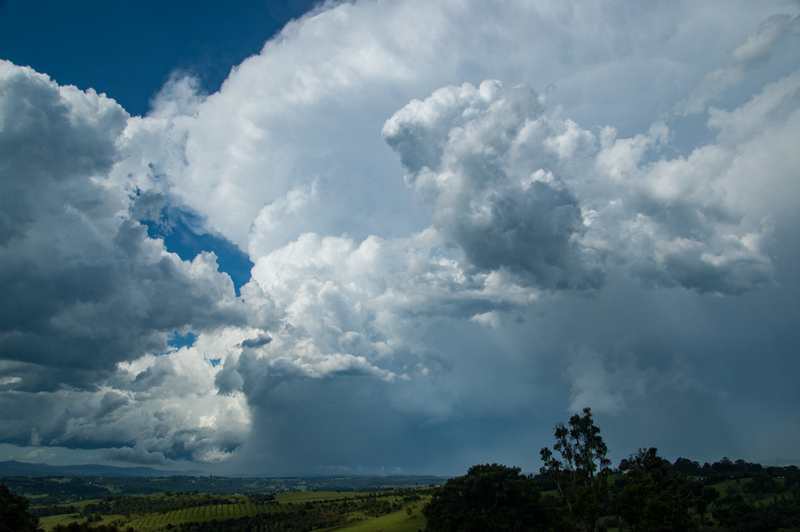 But the main show was over and this storm collapsed and declined rather rapidly. A squall line followed. 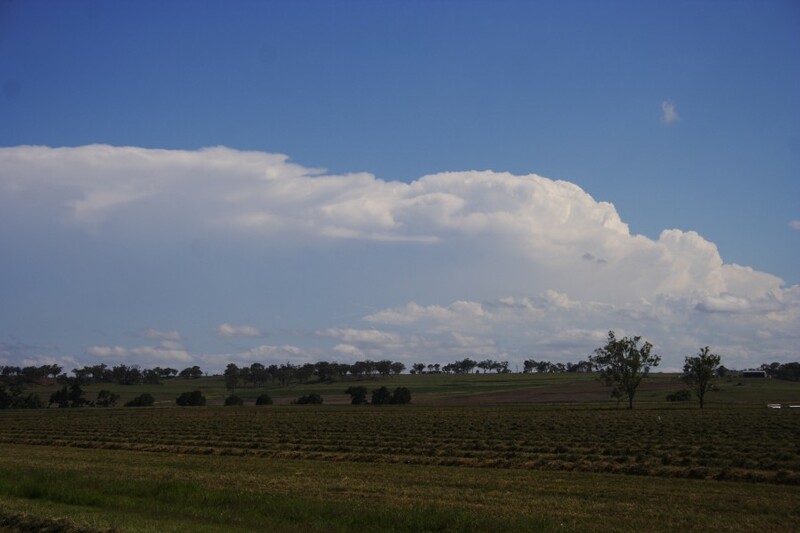 Christmas Day 2008 saw an extension of productive severe storms across the Northern Tablelands and extreme southern Queensland. 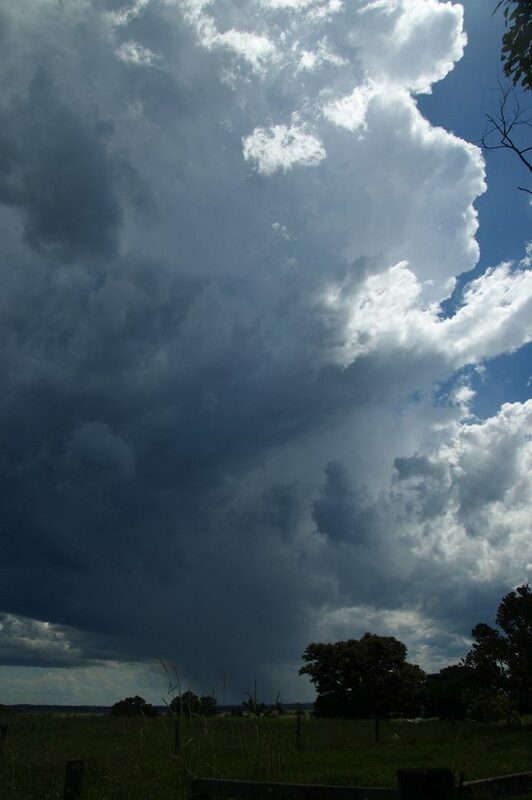 One storm in particular developed and became severe in the region south of Tenterfield. 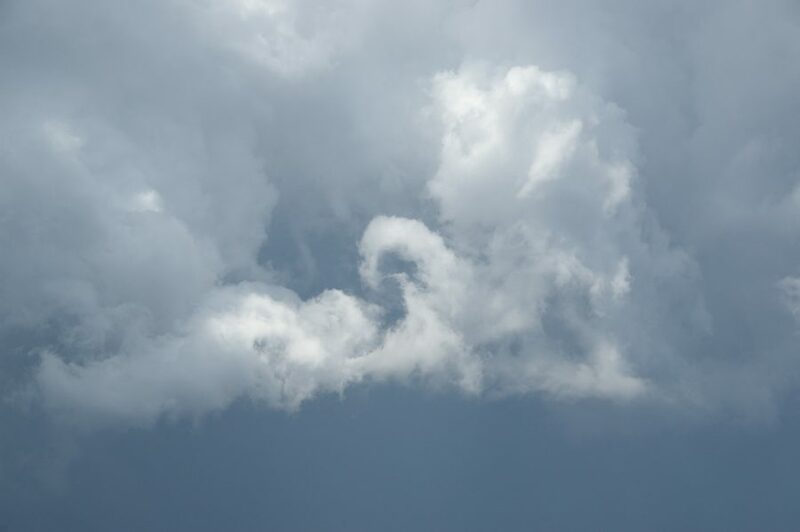 The wind shear on this day lead to a north to northwest progression of the storms. 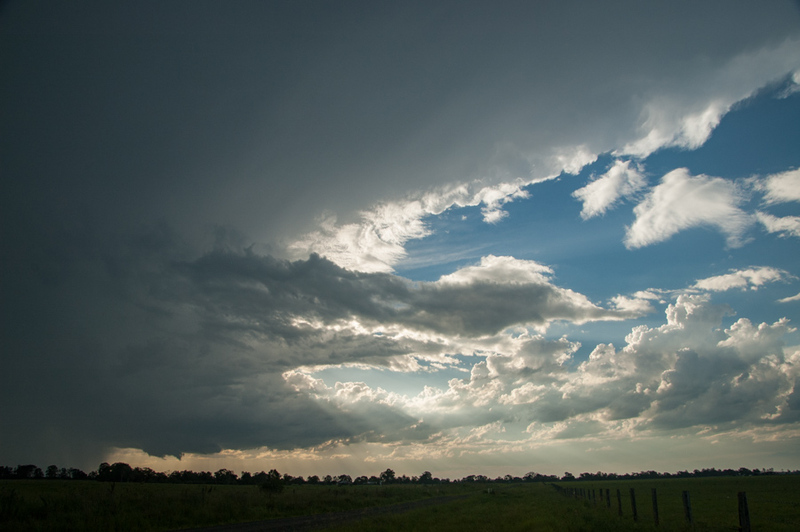 The deep lower layer shear also produced an environment of deep inflow into the storm. 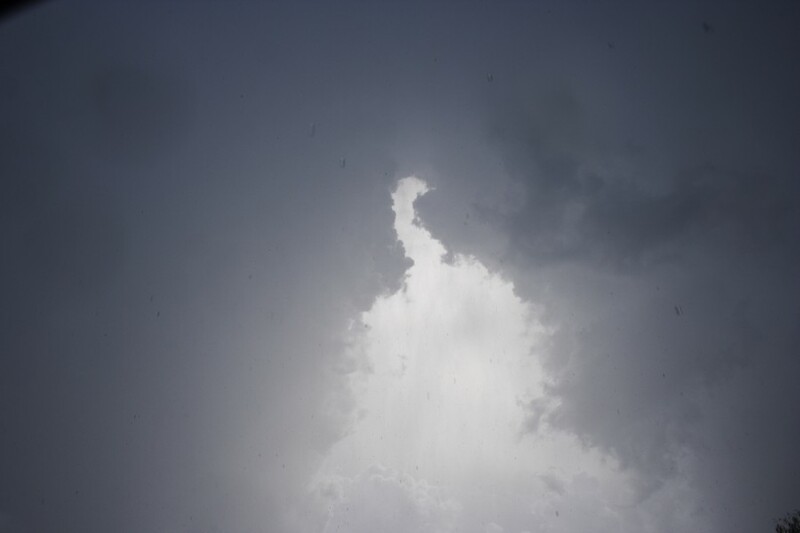 On approach to the storm, a nice "cow-catcher" formation protruded out from the lower updraft as the easterlies fed moisture into the exploding updrafts. 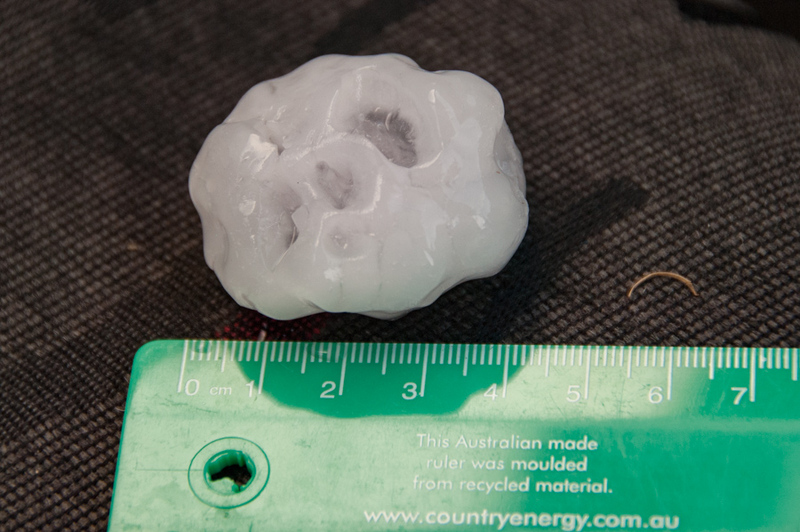 Entering the core resulted in hailstones up to 4cm in diameter being observed. 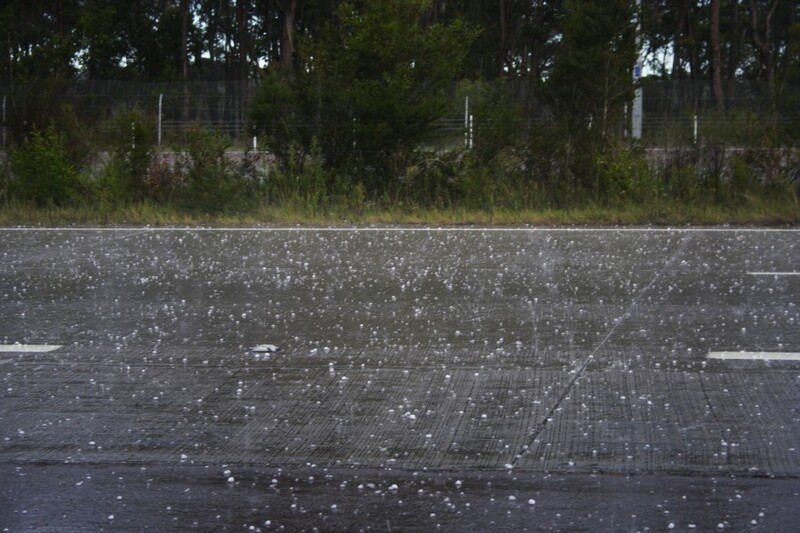 Some accumulations of hailstones in drifts also occurred. 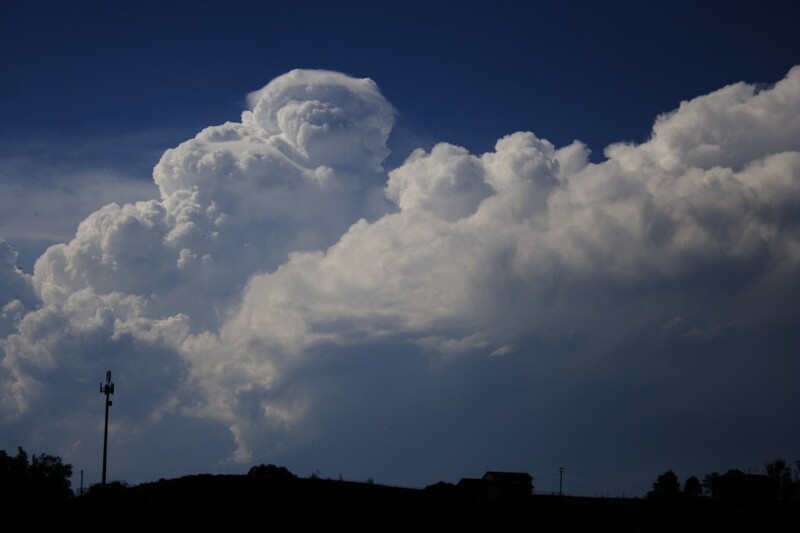 The north coast this season has experienced countless supercells with some impressive structures. 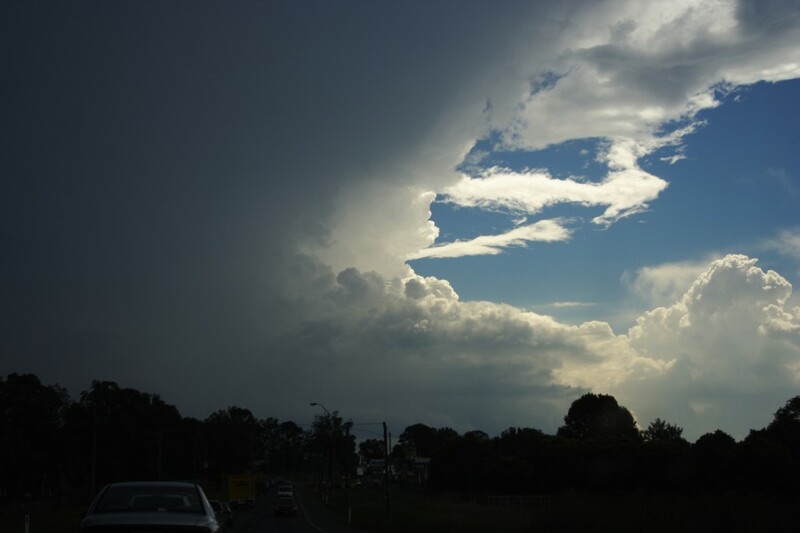 The 10th December 2008 brought two isolated supercells that developed explosively after breaking the cap late in the afternoon. One supercell developed south of Grafton and cut very close to eastern Grafton producing damaging hail up to the size of cricket balls. 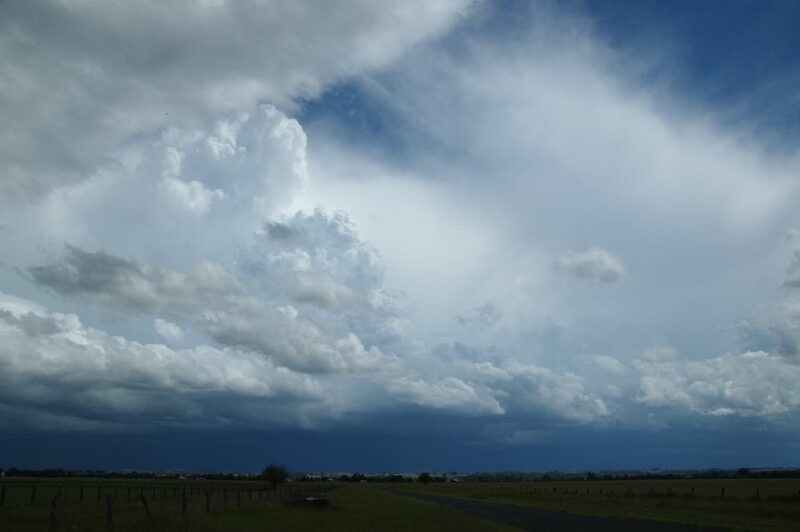 The other supercell developed south of Casino and split between Casino and Lismore. 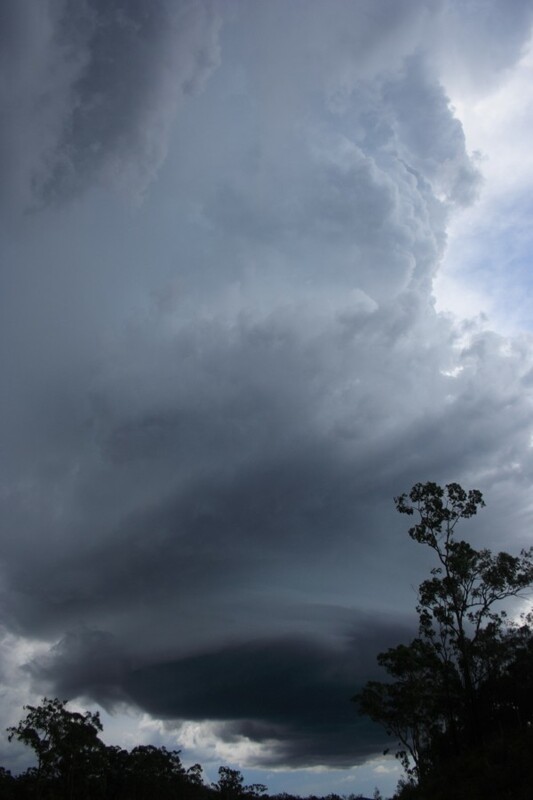 Intercepted by Michael Bath, this cell also produced giant hail and progressed further north to Nimbin before beginning its weakening phase. 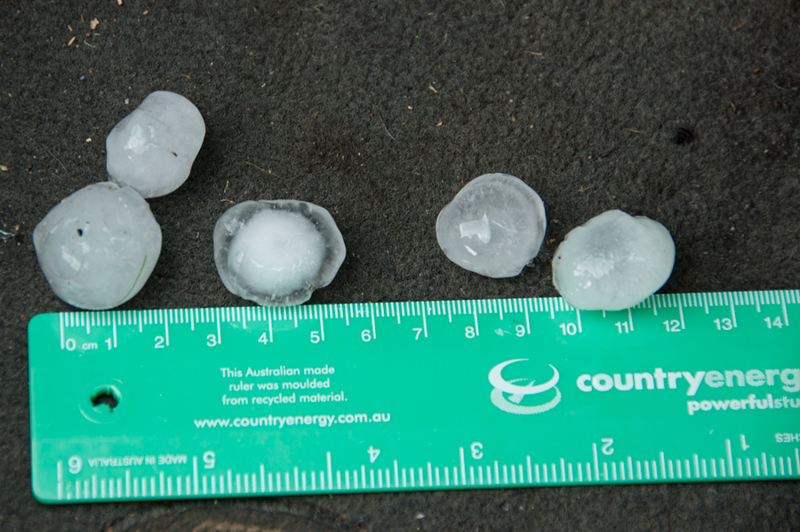 Some of the hailstones that were spawned by the supercell near Casino. Apparently some windscreens were smashed during the barrage of giant hailstones most likely closer to the vault region of the storm. 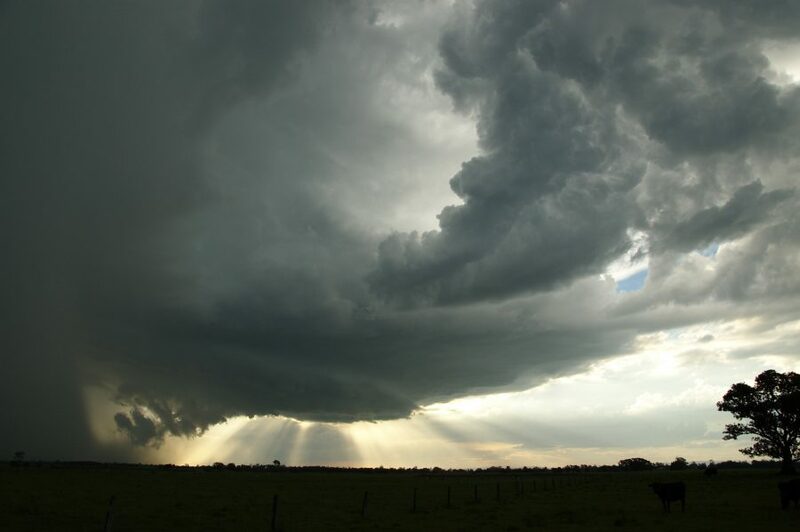 A beaver tail and inflow bands were a feature of this supercell.